I get emails, comments, questions on a daily basis asking me what are the best dog foods, treats, toys…? What’s most popular? And what do I use with my dogs? …My fiancé and me are bringing home a new golden. I am looking for recommendations from you. Would you please help me with any recommendations for: a leash, collar, holster. Any other tips for purchases we can make to ensure a smooth transition? I saw a post from you all about best puppy leash etc but cannot locate? Really appreciate your help!! So, I started putting this list together including Amazon’s Bestsellers (I did include some Amazon bestsellers) and found out the majority of Amazon’s bestsellers in he Doggy Department are real duds! Instead I’m just going to include what I use with my dogs and in my limited experience these are the best dog foods, treats, toys, and other products for my puppies and dogs. Without Further Adieu…LETS GET IT ON! When I search for dog food I always visit the Dog Food Advisor website for more information. They do a great job of rating different dog foods and there are a ton of reviews for most of the popular dog food products. You can also subscribe to get alerts when companies announce recalls. Here are the dog foods I’m feeding my dogs which all happen to be 5 star rated on the Dog Food Advisor website. Orijen Original Dry Dog Food – We recently started feeding Stetson and Raven Orijen Dog Food. Wellness CORE Natural Grain Free Dry Dog Food – Original Formula – I feed the Wellness Puppy Formula to the littles. The Honest Kitchen Human Grade Dehydrated Organic Grain Dog Food – We use this similar to a topper for Linus’ meals. Nature’s Variety Instinct Raw Boost – Archer’s breeder started him on Nature’s Variety. UPDATE for 2019: When feeding our dogs we plan on rotating through different high quality dog foods throughout the year. We actually had all 3 of these on our Amazon Subscription. Needless to say the doggies were pleased! Bully Sticks – We love our bully sticks. Be sure to purchase high quality and odorless (usually still an odor, but not nearly as stinky). Himalayan Dog Chews – Who doesn’t like cheese? Happy Howie’s Premium Rolls – We cut these up and they work great for training and don’t crumble like the Natural Balance rolls. My dogs either want durable or problem solving when it comes to new dog toys. Snuggle Puppy Toy w/ Heartbeat and Heat Pads – This is our new #1 for puppies and their first night home. Nylabone Dura Chew Toy – Adelle loved these giant Nylabones. Just watch your toes! KONG Wobbler – Stetson loved his KONG Wobbler even though it meant he had to work for his meals. Hide-A-Squirrel – It’s just like de-stuffing one of their toys, but instead they’re pulling out a fuzzy little squirrel! Yep, there’s more than 3 essential puppy items, but these products are on the top of our list. By the way, stock up on paper towels. Rocco & Roxie Stain and Odor Remover – We like Rocco & Roxie the best for cleaning pee and poop accidents. Nature’s Miracle – #2 on our list of enzymatic cleaners – it’s a little less expensive and a good second option. Bitter Apple Spray – If your puppy likes to bite (of course he bites, he’s a puppy) then you’ll want some of this handy. Poop Bags – Got Puppy? then…YOU Got Poop! These poop bags are eco-friendly! 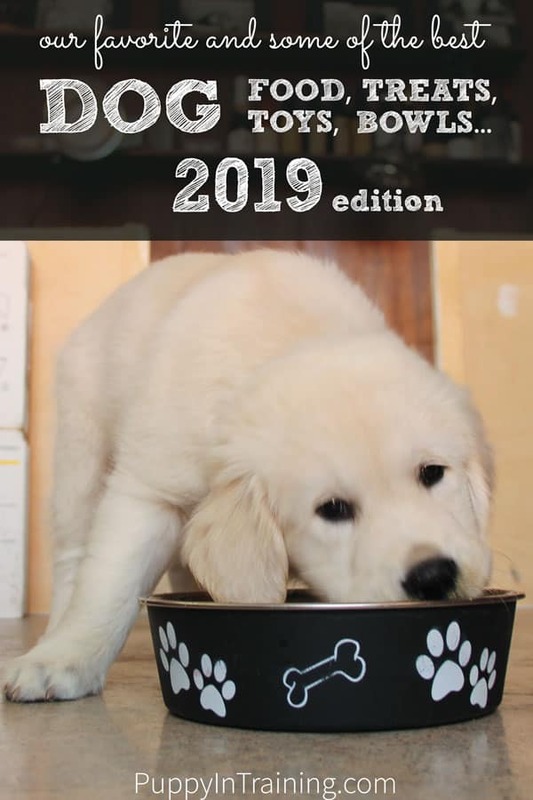 BONUS for 2019: Snuggle Puppy – New Puppy Starter Kit – At the suggestion of one of our readers we purchased this for our current puppy, Charlie Bear. If you’re a regular reader then you probably know about our trials and tribulations crate training puppies especially Stetson. This little stuffed toy comes with a warmer and a little heart beat so your new puppy doesn’t feel alone his first night away from his litter. Guess what? All of our pet beds are elevated. It’s not that we don’t like the traditional cushions, but we do like how much easier it is to clean the our elevated dog beds. Carlson Portable Dog Cot – We put together a sponsored review for the Carlson Portable Dog Cot…and we love it! Coolaroo Elevated Pet Bed – We actually used to have and enjoyed our Coolaroo doggy bed. PVC Elevated Pet Bed – We got one of these at the America’s Family Pet Expo, but there was no brand and I’m not sure where to buy the exact same bed we have at home. There are PVC beds listed on Amazon, but I’m not sure if they’re the same quality as the one we have at home. Midwest LifeStages Folding Metal Crate – The original! We bought this exact crate for Linus over 13 years ago and it’s still ticking…so is Linus! Carlson Pet Products Single Door Metal Dog Crate – A simple, inexpensive signal door wire dog crate. Carlson Pet Products Double Door Metal Dog Crate w/ Divider – We prefer the more expensive double door crate with divider so our puppy can grow with his crate. Archer wearing his Easy Walk Harness. Comfortflex Sport Harness – We use these harnesses exclusively when doing K9 Nosework training. Dog Travel Harness – This is a list of CPS approved harnesses. I don’t own these harnesses, but will soon for safer travels. Breakaway Dog Collar – Our friends just had an incident where her two dogs got caught up in their collars and nearly suffocated. Mighty Paw Martingale Collar – We like Mighty Paw an this durable martingale which has quick release buckle. Tazlab Safe-T-Stretch Collar – Similar to the breakaway collar this one stretches with elastic in case of emergencies. We use different leashes for different stages. Our little guys need lightweight (see #1), convertible leather leashes work best with our older dogs (see #2), and training requires long lines (see #3). Petsafe Nylon Dog Leash – We get the lightest weigh smallest leashes for our puppies. Try the 6 foot 3/8 inch leash. Convertible Service/Guide Dog Leash – This isn’t the exact leash I have, but very close. Mighty Paw Long Dog Leash – Mighty Paw makes a nice long line great for dog training. Not All Products in this category PuppyInTraining approved – Buyer Beware, we’ve only used the Furbo (we love ours) from this list. Furbo Dog Camera – We love our Furbo Dog Camera. Great for tossing treats, watching the pups, and the barking alert works great with our pack. PetChatz – Our pals at Golden Woofs rave about their PetChatz. We don’t have one, but we could always use another puppy monitor! Petcube – We saw this little gadget at BlogPaws. Haven’t used it, but the laser pointer looks like a ton of fun! Check out our Furbo Dog Camera Review. This was a sponsored video and almost 1 year later we still love our Furbo! We recently used it as a puppy cam for Raven’s litter of 8 Golden Retriever puppies. Fun Feeder Slow Feed Interactive Bloat Stop Dog Bowl – A more advanced slow feeder dog bowl then the ones we reviewed in our early days of blogging. Tazlab Aqua Fur Silicone Travel Dog Bowl – After nearly a decade this is still our favorite dog travel bowl. Loving Pets Bella Bowl – We got these as Christmas gifts and used them with our pups. Simple, no slide, and didn’t tip over with our litter of puppies. I’m going to say it once and I’ll say it again. Don’t skimp out if you need a pet nail grinder. We’ve tried multiple “Pet” approved nail grinders (even the Dremel brand) and none met our expectations. Go with a higher end Dremel like the one I list below. FURminator – We’ve had one for years and it’s great at moving the under coat just be careful not to overuse it. Dremel – Don’t go cheap and get one of those silly pet nail grinders. We have the Dremel 8220 and it’s awesome for trimming dog nails! Flea Comb – When Linus was a wee pup we used a flea comb to remove hundreds of fleas. Today we still use it for early flea detection. So many great puppy training books. Here are 3 of my current favorites. Puppy Start Right – More scientific then most of the books I’ve read. It will give you a solid foundation. Puppy Primer – A very simple easy read. 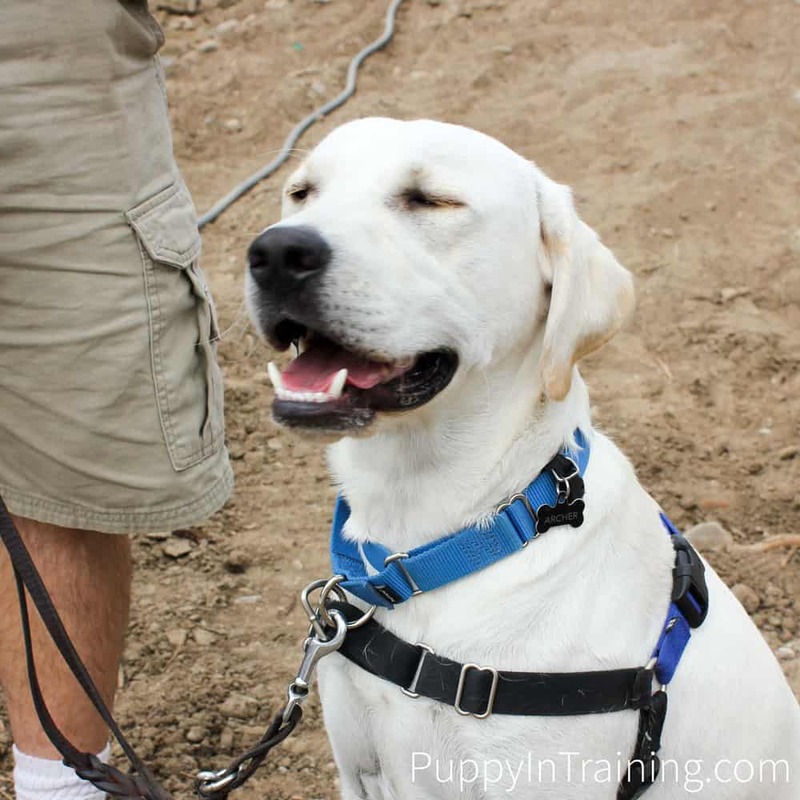 It’ll start you right on your puppy training journey. Required reading for CST puppy raisers. Don’t Shoot The Dog – I kind of feel like this should be required reading not just for dog training, but for life skills. Is there anything else? Am I missing an essential dog product category? If there’s a dog food, treat, toy, or any other product you’d like to recommend please let me know in the comment section below. We plan on constantly updating this list as we find new products we love so tell us about your experiences and let us know what products you love. What do you think are the best dog foods, treats, toys…and other dog products? Best Dog Food, Treats, Toys…and more for 2018! Wow great list!! This would be good for any new dog family or an experienced one! Thanks! I’m going to try and keep it up to date as I find new things I love to use with my puppies. Right now I only have 3 items per category. I’ll probably look to expand that number to 5 so keep checking back for updates. Thank you so much for the list! This will help me a lot! I’m glad the our “Best Dog” list has been helpful to you. Let me know if there any product categories you’re interested in seeing that do not appear on the list. Also, if you come across a favorite dog food, treat, toy, or any other product let me know and I’ll test, review, and if it’s worthy add it to our list. Nice to see some of the Mighty Paw products on the list. I also recommend the book “Puppy Primer” like you said. It’s an easy read and has advice you can start using right away. I read it when I got my puppy Remy and it was both a good review/reminder and gave me some new ideas. We very much like the quality of the Mighty Paw products and we actually noticed some of our guide dog friends using the Mighty Paw martingale collar we got from our ThatMutt.com Patreon subscription. The Puppy Primer is definitely an quick/easy read and provides a solid foundation for getting started with your puppy. I see many people recommending Wellness’s dog food but unfortunately they do not ship to Brazil. And just a few of the most famous brands, such as Farmina, which are very big and work here in our country as well. Here it is still very common to be charged for high values and poor quality dog food. I would love to have the opportunity to give good dog food to my daughter! We’ve done a few sponsored reviews with Wellness, but they have been our dog food of choice several years before we did any sponsored work and continue to feed our dogs Wellness Core and the puppies Wellness Core Puppy Formula. Unfortunately, I don’t know any dog food brands in Brazil. One site we like to review before trying new dog foods is DogFoodAdvisor.com. Thanks for visiting! Great list. I ended up getting my dogs the bully sticks. OMGosh they went crazy over them. I will continue to try others from the list. Thank you. I haven’t had a dog that didn’t like the bully sticks. We’ve had some that smell really bad (I bet the dogs even love them more). The bully sticks we recommended say “oldorless”, but they still smell just not quite as bad. Specially i liked the cameras. I don’t want to make my baby lonely but due to work i have to leave. Loved Furbo Dog Camera as it has treat tossing feature. Yep, the cameras are a ton of fun. Each on has it’s own little speciality. Furbo tosses a treat, PetCube has the laser pointer and PetChatz has the little screen. As I mentioned earlier we have a Furbo Dog Camera, but the other two items we’ve only used our friends or played with demos. How do you use the dremel tool on dog nails? 1. Show them the dremel, but don’t turn it on. If good experience praise/reward/ End session. 2. Gently touch one paw with dremel while off. If good experience praise/reward/ End session. 3. Increase amount of time touching paw with dremel off. If good experience praise/reward/ End session. 4. Touch multiple paws with dremel off. If good experience praise/reward/ End session. 5. Turn dremel on keep it a distance from puppy. If good experience praise/reward/ End session. 6. Turn dremel on and bring closer to puppy, but don’t touch nails yet. If good experience praise/reward/ End session. 7. Turn on dremel and lightly tap one nail. If good experience praise/reward/ End session. 8. Turn on dremel and lightly tap one nail for longer period of time. If good experience praise/reward/ End session. 9. Turn on dremel and lightly touch multiple nails. If good experience praise/reward/ End session. 10. Turn on dremel and trim multiple nails. If good experience praise/reward/ End session. Try to take it slowly. Every puppy responds differently. You may need to slow down or speed up the process outlined above based on your puppy. I’ll see about putting together a full blog post with video on how to use the dremel with your puppy.